Russell Knox rolled in two amazing, near-identical putts on both the 72nd and first play-off hole to claim the Dubai Duty Free Irish Open. 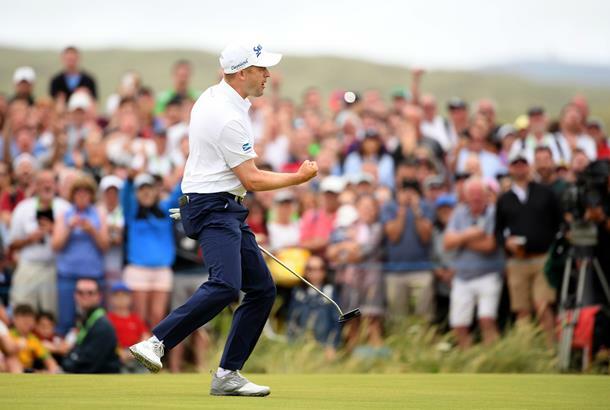 Russell Knox rolled in a 40-foot putt on the 72nd hole of Ballyliffin to finish with a six-under 66 to match Ryan Fox at 14-under-par, before holing out from a similar distance and line on the first extra hole to claim the title. Knox, who began the day six shots behind overnight leader Eric Van Rooyen, described his first victory since 2016 as 'a dream come true'. With an early eagle on the fourth hole, the Scot added birdies at both the sixth and 10th holes as Van Rooyen struggled with three bogeys in his opening nine holes. A solitary blemish came on the 11th hole, but Knox quickly bounced back with a birdie on the 12th, before adding a further gain at the 15th to move in to a tie for the lead with Van Rooyen, Jorge Campillo and Ryan Fox - who had just dropped a shot on the 14th hole. Fox then two-putted for birdie on the 17th hole as Knox made the first of his enormous putts on 18 to set the clubhouse target at 14-under, giving the New Zealander a chance to claim the title if he could make birdie on the last. Instead, his putt slid by the hole and the pair headed up the 18th once more. Fox once again was the closer of the two, but 40 feet seemed to be Knox's distance as he drained his for birdie, and Fox's putt horse-shoed around the hole. “I hit two great putts on 18, one grazed the edge and one came back at me,” Fox said afterwards. “I'm happy, I hit the shots I wanted to down the stretch, felt comfortable out there and it was close. The consoloation for Fox is that he did claim one of the Open qualifying spots given to three players in the top 10 and not already exempt. Andy Sullivan and Zander Lombard took the other two places after finishing tied-sixth. Meanwhile, Knox's victory moves him back inside the World's top 50, a week after guaranteeing his spot at the 147th Open with a 2nd place finish at the Open de France. Knox might have hoped the 'apple throwing' incident would be overshadowed by his victory, but we reckon it's a part of the Irish Open that we shouldn't forget in a hurry. So if you haven't already seen it, here's what happened when Knox tried (and hilariously failed) to throw away his apple while on the green.